Sunrisers Hyderabad and Kolkata Knight Riders will come up against each other in the penultimate match of VIVO IPL 2018. Qualifier 2 is the last hurdle before one of these teams can progress to the title clash. The Sunrisers need to arrest their four-match losing streak if they hope to make the final. Prior to their four back-to-back losses, SRH were on a roll; they had won 8 of their first ten matches, had stitched together their longest winning streak (6 matches), and became the first team to secure a playoff berth. Their form has fallen away alarmingly. In the first three losses, the bowlers came under the pump, while in the recent loss to CSK in Qualifier 1, the batting came apart altogether. Momentum can do wonders and work like magic in T20 – if it is the right kind. To snap a losing streak is a challenge by itself; to be asked to do so in a knockout match compounds the level of pressure. Will SRH be able to cope with the pressure and pull one off? The Kolkata Knight Riders’ journey is just the opposite; they are on a four-match winning streak and have the right kind of momentum. Most recently, in the Eliminator, they defeated the Rajasthan Royals, who at one stage were comfortably placed in their run-chase. That is what momentum can do; KKR got one little opening when Ajinkya Rahane was dismissed, and they seized that opportunity and forced a win. The captains are the two team’s top run-getters this season. 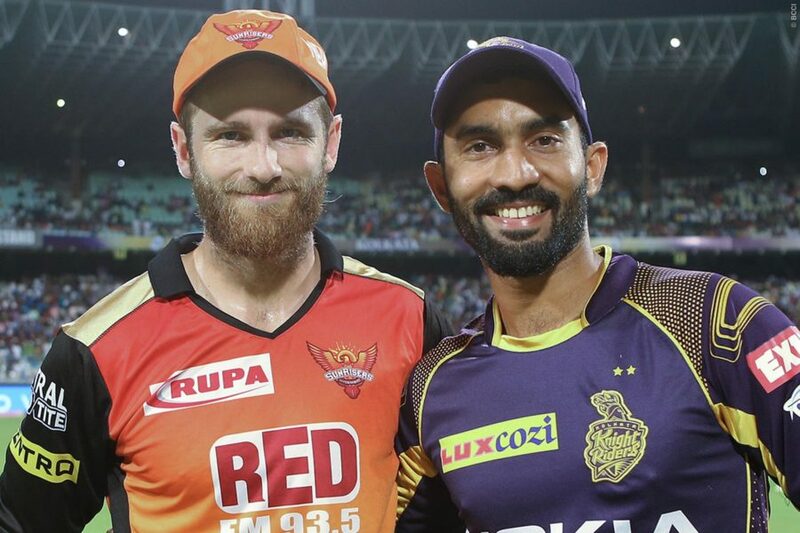 Kane Williamson and Dinesh Karthik have led by example for SRH and KKR respectively; Williamson’s aggregate of 685 runs equates to 28.9% of his team’s runs, while Karthik’s aggregate of 490 runs equates to 18.9% of KKR’s runs. Sunil Narine has been a big contributor to KKR’s success too; on days he has fired at the top of the innings – which has occurred quite frequently this season – he has helped KKR gain the early momentum. No target is beyond the reach of, and no cause is lost until the two all-rounders from the Caribbean are at the crease. Carlos Brathwaite and Andre Russell are capable of doing plenty of damage with the bat in double quick time. Both players will be high on confidence after their recent knocks; Brathwaite scored 43 off 29 balls against CSK, while Russell destroyed the Rajasthan Royals with his 25-ball 49. The Sunrisers need their most-experienced bowler – Bhuvneshwar Kumar – to strike a rich haul. The last time he visited Kolkata, he collected his best figures of the season – 3 for 26. Rashid Khan is the one other bowler most likely to do plenty of damage with the ball; even the best batsmen have found it difficult to read the spinner from Afghanistan. The teenage leggie, who has 18 wickets this season, will be mindful of his dismal record against KKR; he finished wicket-less in both the league-stage matches against KKR. The spin trio of Kuldeep Yadav, Piyush Chawla and Kuldeep Yadav will be at the heart of KKR’s bowling plans. Each one of them is attacking by nature and has bowled a match-winning spell at least once in the season; together, they’ve collected 42 wickets which account for nearly 50% of the wickets taken by KKR bowlers. The Kolkata Knight Riders are undefeated in the two playoff matches they’ve played at the Eden Gardens. In 2014, they defeated Kings XI Punjab in Qualifier 1 at the Eden Gardens. And then, most recently on Wednesday, they defeated the Rajasthan Royals in the Eliminator. The odds are stacked against Shikhar Dhawan, who was dismissed for a first-ball duck in Qualifier 1; the left-hander averages 11.00 in nine playoff/knockout-stage matches, and averages 18.63 in IPL matches at the Eden Gardens. Sunil Narine has 3 wickets in 8 in playoff/knockout-stage matches; the Trinidadian’s economy rate in these matches is 7.88 – which is in stark contrast to his economy rate of 6.43 in league-stage matches. The winner of this match will set up a date with the Chennai Super Kings in the VIVO IPL 2018 Final, which will be played at the Wankhede Stadium in Mumbai on May 27. For the team that ends on the losing side, it will be the end of the road in the context of this season of IPL.